Subject: Site where Applegate Trail crosses the Klamath River. The first emigrant train over the ‘Southern Route’ including more than fifty wagons under the leadership of Captain Levi Scott and David Goff, left the Oregon Trail at Fall Creek or Raft River on the Snake River, August 10, 1846. 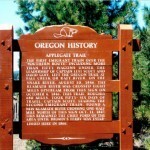 The Klamath River was crossed eight miles upstream from this sign on October 4, 1846. This trail, roughly 680 miles, took fifty-six days of travel. 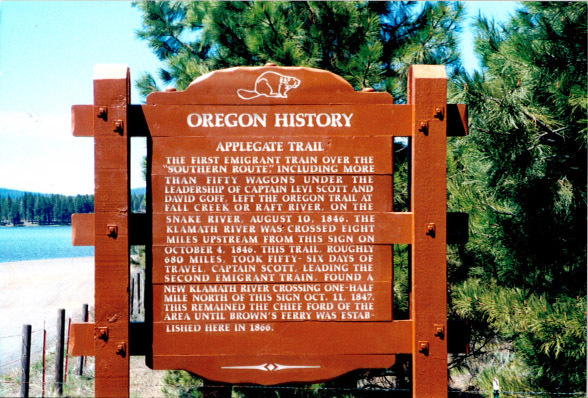 Captain Scott, leading the second emigrant train, found a new Klamath River crossing one-half mile north of this sign, Oct. 11, 1847. This remained the chief ford of the area until Brown’s Ferry was established here in 1868.